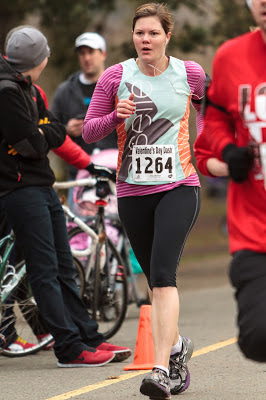 Oh heyyyy, I ran a race the other weekend! I think this is the longest I've taken to write a recap. Since I wasn't 'racing' it, I sort of let it fall through the cracks. 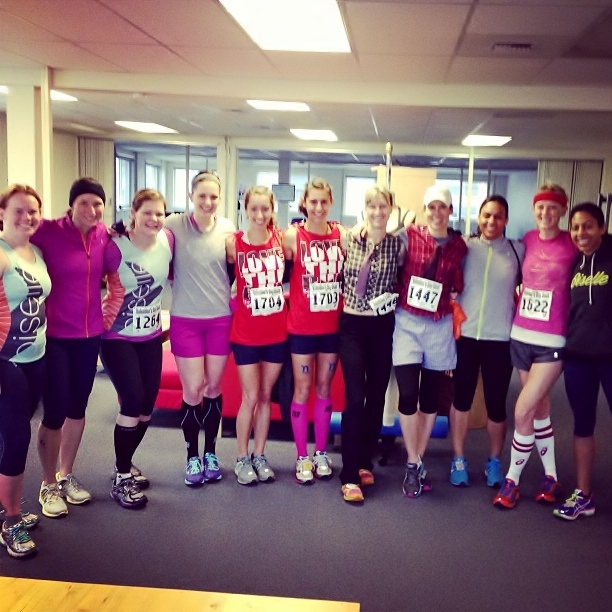 It was super fun, though, and bound to become Oiselle tradition. I got to the race early for packet pickup and scored one of the last spots in the parking lot right next to the finish line. What's great about a race at Greenlake, though, is that you can park on any side streets around the lake and you're probably not much more than a mile walk to any start/finish line. I did a brisk mile walk from my spot at the boathouse over to Oiselle HQ (near the Greenlake Starbucks) so I could meet up with everyone at the office for pre race pics and a warmup jog back over to the start. I wonder if covering two miles beforehand worked against me because I was a little winded from getting over yet another cold and did about 100% more warmup than I ever do in a 5K. Which is to say, I usually do a couple of strides and call it good. Nonetheless, it was nice to take it easy over to the start and chat with Dawn and her husband, as I knew I wasn't taking down any PR. 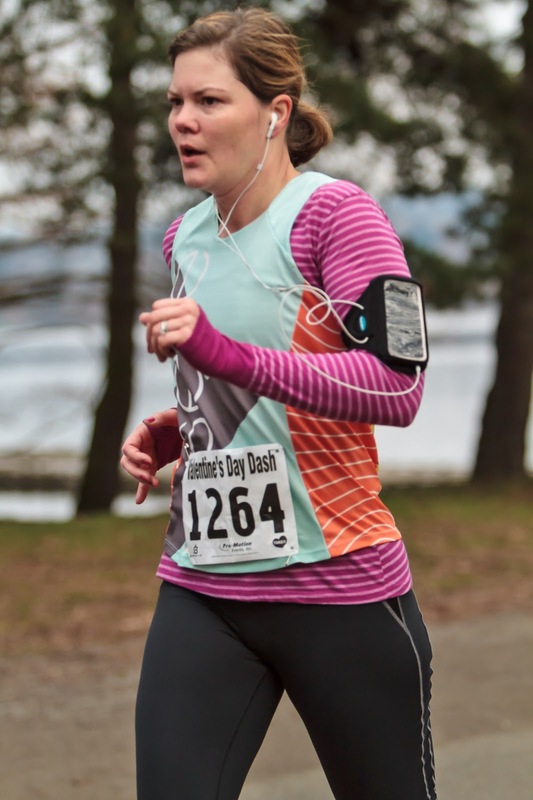 Once we got to the start, I began to assume the role of 'mother hen' at the race, as I did for Natty at the Snohomish River Run. My first duty in this role was to sherpa everyone over to my sweet parking spot for team VIP 'gear check.' The second duty is a funny anectdote for the end of the recap. Then I ran into Tweep Meghan, who I was supposed to run with for nine miles before the race, since I was on the same marathon plan for Eugene. 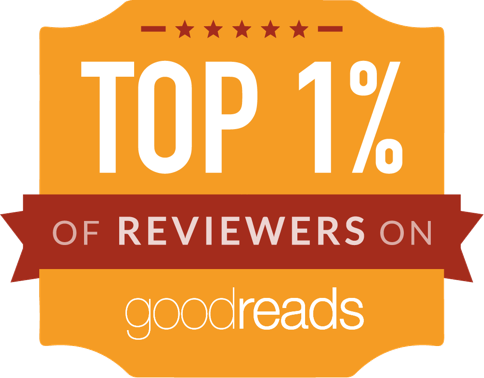 Spoiler (not really): that didn't happen. It was great to still be able to hang out with her and a number of local yokels. After hitting the port-a-potty, which there were plenty of, I lined up with Nolana and Morena in a corral that I deserved to be in about 6 months ago. (Morena & Nolana on the far left & right with Team Manager Kristin) Love these gals, Love this pic: thanks for taking it Jacquelyn! The course was a nice easy loop around the lake and I was rather impressed that I didn't feel crowded in at all throughout the run, given that there were nearly 2500 participants. The only problem I had was in certain sections, deciding whether to run on Greenlakes's outer path that's mostly gravel or on the street. I weaved back and forth and probably should have just stayed on the street. Otherwise, it was pretty non-eventful the whole way through: I kept things in low gear so that my hamstring didn't hurt too much, no splits to report, no play by play. It was just what it was meant to be for most people - a fun run, as evidenced by decent race photos! I think this is the key to good race photos: not RACING. I think it's time to update my Oiselle profile pic! Hmmm, top or bottom one? I also need to update my Q&A, it's been nearly a YEAR! Thanks so much Irwin for the photos. I put a somewhat hard effort in at the end, through the 'tunnel of love' and clocked it at exactly 28 minutes. That's pretty much 4 minutes slower than my fastest 3 miles at the Labor Day 4 Miler. Yeeesh. At least it wasn't a personal worst, like I initially thought; it was still better than my return to running races two years ago where I ran a 29:38 at the Can Do 5K. Post race, they gave out little bags of candy that I thought were supposed to be chocolate. Alas, they were really heart shaped jelly bean type things that I saved for the kids. There was some chocolate sampling from Wow Chocolates and plenty of the usual post race suspects: bottled water, bananas, and tons of Food Should Taste Good chip samples. After chatting everyone up afterwards, tweep Meghan and I started heading towards my car so I could give her lift towards her house. Here's where my other 'mother hen' story comes in: there were three girls who'd just finished the race wandering on the opposite side of Greenlake looking very lost as they flagged us down and asked for help. They ended up sheepishly asking if they could bum a quick ride to where their car was parked, as they were from out of town and had NO idea where they were. The mother in me was worried for them and the Chicagoan in me TOTALLY understood how easily one can get lost on the streets of Seattle. So they piled in with us and we all had a good laugh about never having hitchhiked/picked up hitchhikers as I used my GPS to navigate them to their car. We also had a nice little chat along the way about running and, of course, Oiselle - I think I've got a few more converts. 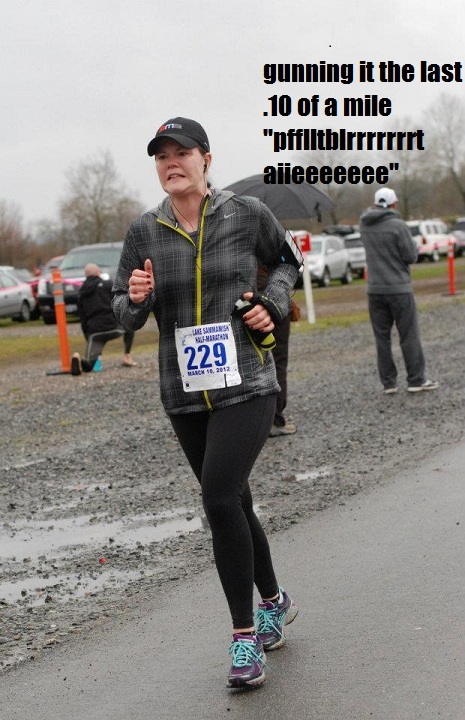 ahhh, this picture from my 13.1 PR... it gained some fame on Ugly Race Pics and The Boring Runner featured it on his funny photo Friday. But, hey, if you're not bringing the pain face at the end of a race, you're doing it wrong! Those race pics are excellent! I like the bottom one the best! I think you have great race pics, you look strong! 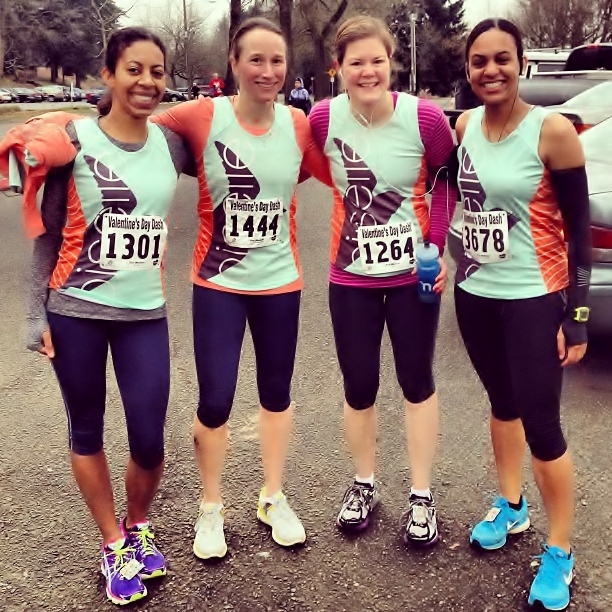 I like the 2nd pic best for your Oiselle profile:) Great job! !